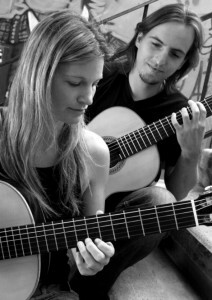 The Guitar Duo KM was founded while Katrin Klingeberg and Sebastián Montes were both studying at the University of Music in Hanover, Germany. As a duo they gave their debut in 2005 performing the Concierto Madrigal by Joaquín Rodrigo for 2 guitars and orchestra. Since then they have performed extensively in many countries in Europe, South America, the USA and Japan. Besides giving concerts the two musicians are invited to give master classes and as jury members at international festivals and competitions. From 2008 until 2012 Katrin Klingeberg and Sebastián Montes completed a chamber music master’s degree and after that the concert exam under the tutelage of the renowned Kaltchev Guitar Duo in Stuttgart. In February 2012 the Academy of Music and Performing Arts Stuttgart awarded them the diploma with maximum distinction. Even before completing his studies the Universidad Católica in Santiago de Chile appointed Sebastián Montes to a professorship wherefore Sebastián and Katrin moved to Chile in April 2012. They return several times per year to Europe to maintain a strong presence in the concert world. In 2010 the Debut CD, Guitar Duo KM – RECITAL, has been released and in 2013 the second CD Gracias a la vida has been published by the german label studio24. This production includes a latin-american repertoire. Most of the pieces have been arranged especially for this project. After numerous first prizes in international competitions the Guitar Duo KM is now one of the most acclaimed guitar duos in the international guitar scene.